Increasingly, companies either turn to the lowest automation bidder or get bid revisions to pull out valuable content… which should be an immediate red flag for lower profitability and higher risk, shouldn’t it? Every “automation house” will tell you their customers like great results but are rarely willing to pay for it. For example, say that smarter content would give them another $35k/yr profit, but the customer’s launch manager “can’t” spend the $6k difference in capital cost that would cost them $50k and a few days of retrofit downtime to upgrade later. Result: the failure to invest $6k becomes a permanent annual loss of $35k in profit. That’s only a small example that barely scratches the surface, yet three small examples like that would pay the entire cost of a Smart Welding Engineer (SWE), year after year. High Performance World-Class Welding requires the extensive oversight and input of a Smart Welding Engineer. A great welding engineer works hard and long through the automation launch process while juggling current production needs, because he’s birthing and maturing a baby that he doesn’t want crying in the middle of the night for months. He looks at it from the operator perspective, the quality perspective, the DFSS and DMAIC Control perspective, the profit perspective, and the maintenance tech perspective, keeping in mind the welding physics that must be balanced, controlled and faithfully served in predictive process maintenance. He breathes detailed expertise into the launch so that it will quickly ramp up into a new benchmark for profitability and quality. He knows that a highly successful automation launch will allow his company to leap ahead in profits, gain stature with customers, and have a new vantage point to envision design improvements. Donkers was revealing the brilliant profitability strategy of investing in control systems that have been engineered to contain real-time expertise that can deal with all the complex variables that a real expert knows are going to change. Then he summarized in the final paragraph: “Firms that want to lead the industry by creating sustainable competitive advantage need to combine human intuition and creativity and brute computing power to eliminate human errors. Companies that manage to find the right interaction between the two will outperform their competitors that depend solely on humans or computers, or those that depend on the combination but did not manage to get the interaction between the two right.” Exactly. In other words, breathing expertise into a strategic automation system can yield results with a breath-taking competitive advantage when the human interface is well executed. High-performance automation results (by which I mean consistency in high quality and high profitability) hinge on building (integrating) great expertise into the automation. This takes a Smart Controls Engineer, a sharp robotic integration programmer, and a Smart Welding Engineer working together to select and well-integrate good software with high-performance component systems of superior design. Examples: including invisible expertise to reliably start the arc and to initiate motion only when it’s truly established; combining expertly simplified yet powerful user interfacing with targeted training that teaches operators and technicians clear procedures to use in avoiding (preventing) defects and in easily recovering from all predictable machine and process errors. Over and over and over, I have seen welding systems or automation results fail in those key areas: activating motion while the arc is still trying to start; interfacing that is confusing; interfacing that fails to provide clear recovery paths for the predictable faults/errors/problems that a true process expert can recognize during concept/design/build; system integration content and/or technical training that falls short of re-establishing controlled quality and functionality prior to producing defective parts; systems that enable the process but do not include process expertise. Point: these issues determine the upper “entitlement” levels of system efficiency, uptime, throughput, cycle-time, COPQ, and sustainable achieved quality. Hint: creating automation of processes involving highly complex physics and sciences with multiple interactive variables (i.e. welding) without intimately involving a trained and experienced process expert is already doomed to mediocre results in a competitive market! How can the truth be any different? Is that really the kind of welding automation you want and need? To clarify, BOTH of those paths require you to have a good welding engineer on your payroll. Without one, I’ve never seen sustained world-class quality and profitability. I’ve seen some examples of good results, but not fabulous results to their potential, sustained. Why is it that outside integrators can so rarely deliver true high-performance (world-class) turnkey results in welding automation? Unless they have a really superb degreed welding engineer with experience in the obstacles and nuances of getting high-performance results on assemblies similar to yours, it’s likely that only your internal expert welding engineer can provide the insights required to get high-performance results on a world-class level. Unless you have your own internal Smart Welding Engineer (SWE) who is tasked to ensure great results, you start off crippled. First, you have no-one charged with identifying the best welding processes and approaches, rather than the approach that “everyone” is probably going to quote because it’s an easier sell of familiar technology. So it’s nearly impossible to successfully identify, approve and implement high-profit innovation. Second, you have no-one capable of hearing and effectively responding to the integration supplier’s welding concerns & needs during design/build/run-off. Nearly always, this lack will force problems onto the integrator, miss great one-time opportunities, and lock painful-to-mediocre results into your financial and quality metrics. Third, even if you have a great integration provider who wants to provide and can talk you into a high-quality solution, they’d be reluctant (and maybe nutty) to sell you newer technology that you won’t be willing and able to support: it will run great until you take it over, you’ll cause all your own problems, they’ll take the rap and headaches, and they may not be able to sell you anything else for a long while. Mediocre Inputs = Mediocre Output. Without either internal or external welding expertise, the welding processes will be chosen on the basis of familiarity rather than profitability, the inherent process limitations/capabilities of the welding equipment will be chosen by the most successful salesmen, and the output results of the input variables will be whatever someone’s guesses give you. Doesn’t that sound like a perfect recipe for stressful, mediocre results? And yet if it’s “running good”, everyone will believe the process has been “optimized”! Next, after 12-24 months of production results convince you that improvement should be possible, try making it a Six Sigma project and let them struggle and bog down without a welding process expert. (Remember that involving a process expert is a key foundational requirement for a SS team.) They’ll take too long to make a few small incremental improvements, then everyone will ponder why the improvements have vanished in 6 months. Once again, the cost of that SS team project would have paid for a SWE. If you feel your guys are “pretty good” at welding so you “don’t need a real welding engineer”, you’re mistaken. Being “pretty good” or having “lots of experience” is the equivalent of substituting tribal knowledge for science, or an Excel class for an MBA. Tribal mythology can never make up for the foundational lack of 3,000-4,000 hours in formal welding science training that an engineer has in those highly complex processes. That’s a mistake your mediocre competitors also believe: you’ll find critical perspectives here in Beyond Welding Divas to World-Class Success – Why 15 years of welding doesn’t make a Welding Engineer. It’s also a mistake that a trusted integrator might strongly encourage, so that they can manipulate you for highest pocketed profits rather than selling or delivering what’s best for your company. If you have a good welding engineer but don’t trust him enough to ask, listen and back him up, then you are probably wrong on one of two counts: either you didn’t hire a Smart Welding Engineer, or you are not willing to trust welding decisions to your welding expert. Which one is your case, and what actions do you need to take to fix the problem before your profits suffer for it? What about the difference between 2-yr A.S. and 4-yr B.S. Welding (or Materials Joining) Engineers? A.S. degrees are good for hands-on welding environments and can enable, sustain or manage established welding automation, but the B.S. degrees weave welding physics and basics on the other engineering disciplines into the picture, providing the deeper insights and broader viewpoints that are usually required to launch high-performance welding automation or achieve it through incremental continuous improvement. If at all possible, start the process to hire a really good, sharp welding engineer. Study How to Hire the Welding Engineer You Really Need and Welding Engineer Salary Compensation Data to get the ball rolling. Why? Because your core business is selling your expertise at manufacturing welded assemblies. Am I right? Fact: the most complex processes in industry are the welding processes. How’s your core competency doing in your most central, most critical technologies? There’s product design engineering, but also process design engineering and continuous process improvement. Do you see how you can blow the doors off your competition if you start engineering your most complex manufacturing processes? Put together a clear results list of the measurables you want to accomplish and put in the RFQ and purchase agreement, and discuss them with the integration companies you’re considering. Pick their brains for ideas and suggestions, too. Understand fully what the quotes include. Get everything you want down clearly on paper then do a revised RFQ so that the quotes are all apples-to-apples. You may be surprised to find that the “expensive Cadillac cell” from the seasoned strong-reputation integrator is suddenly among the lowest bids. Ask each potential integrator for a list of the welding experience and welding education, and controls experience and education of their people, by name, who would work on the project. This can reveal more than you’d imagine. Some recent conversations have made me wonder if a quiet new trend might be coming: integrators hiring customer-seasoned high-performance welding engineers to maximize welding automation, rather than using techs or hiring and teaching recent W.E. graduates to program robots. Give your best people a top priority to handle the critical project meetings: the final concept review, the kickoff GD&T/tooling/gauging review meeting to ensure coordinated content, the initial welding tooling design meeting, the final tooling design review and signoff, the functional tooling review (90% complete), the HMI operator/maintenance screen content and layout, as many intermediate offline programming review and automation build review meetings as the integrator requests (at least two prior to a pre-runoff visit), planning meeting for systems training for welding techs, maintenance and operators, and about three system performance review gates after installation and through ramp-up. To the extent that your company “blows off” those or can’t imagine what to do in such meetings, you kiss away the “high” in “high performance”. If all of that sounds like you badly need a Smart Welding Engineer, you’re seeing the light. (And I bet you know someone else who should read this.) If it sounds like ridiculously detailed overkill, perhaps the masterminding of thousands of details is why I’ve been able to consistently set new industry benchmark standards for welding automation performance, sustained at levels of dramatic improvement and large profit margins using detailed procedures and customized training. If you think you can’t hire because you’re trying to cut costs, that’s slow-motion suicide – I recommend a profit approach. Why make the same classic “turnkey” mistakes in purchasing welding automation… mistakes that many of your competitors are still making? The rare high-profit expertise approach will deliver a level of success that the “low-cost” turnkey myth never can. This entry was posted on Tuesday, April 6th, 2010 at 4:45 pm and is filed under Competitive Advantage, Core Process Expertise, Manufacturing Management, Manufacturing Profitability, Robotic Welding, Smart Welding Engineer, Unqualified Welding Engineer, Welding Engineer, World Class Welding. You can follow any responses to this entry through the RSS 2.0 feed. You can leave a response, or trackback from your own site. Fraser Reid • Well its a good article, rambles on a bit, I got bored 1/3 of the way through.Trouble is most companies don’t have proper welding engineers, only “industrial engineers”. Getting sick and tierd of trying to tell these people to shut up and do as I say, they seem to take exception to my attitude ? These industrial engineers seem to think they actually know something about automation and welding, and I keep going through the same old loops, why dont they just listen ? You could actually get a proper integrator like me to install the welding system,been welding since 16yrs old and getting on a bit now. Been in welding robotics since 1980, seen the good and the bad. You see you need to install then take an actual active interest in supporting the client. Reason being it gets repeat business, and that’s an easy sale. Another massive issue is robot companies only really want to sell robots, line builders only really want to make tooling and mark up the boughtins. Only us small independants want to do the complete job then look after the client for years to come. I have worked for the big boys, both robot companies and line builders, I know the score. Another “big” factor is money, as always. No issue with that, but you really need to add a bit of pride working in this game. Find someone with passion in what they do. TTFN. Scott Cornelison • I agree with Brian Dobben and Fraser Reid, it is hard to find welding expertise in these big robot integrating companies. 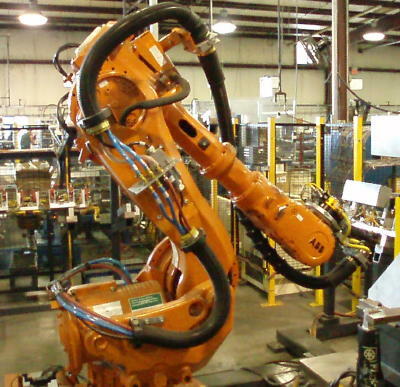 Like Mr. Reid, I too am an independent integrator, have been in the welding/robotics industry for 20 years, have seen many self proclaimed expert welders from these big robotic integrators come and go. After there budget has been depleted these integrators start pulling their people out because they can’t bring the project to completion. On the subject of welding/industrial engineers, I have not met one of these engineers that could manually make a weld, not to mention set the parameters for a per print weld, robot torch angle and seam tracking on the robot system. Then of course there is heavy welding with mulipass replays, thru the arc adaptive, calculated adaptive and adaptive fill with vision cameras. The heavy welding and all of the tools available is my expertise along with all ferrous metals, non-ferrous metals, any thickness, single wire, twin wire and most welding processes. ie: SMAW, FCAW, TIG, Laser, Laser Hybrid, plasma etc. There are not very many “in house experts” in companies thus far and the only way to get this type of expertise is to hire an independent to complete the aforementioned tasks. Good expert robotic welders is somewhat easy to find, but excellent expert robotic welders that get the job done is not so easy to find! Fraser Reid • Nice one Scott, tell it how it is. I did 5 yrs apprenticeship to learn to put a weld down correctly, and have been 35yrs learning the trade, still got a bit to go though, always learning in this game. What do people expect of people who cannot even get close to an arc without pooping there pants ! By the way, it took a major line builder 6 months and 100’s of K to try to weld an ally joint on a famous british car, rotators, clamps, controlled enviroment bla bla bla. I did it in 2 days, sorted. We have also broken a bit of the mold here in the UK, a major car company only uses us to program its axle lines. Line builder does the system/tooling/controls then its handed over to us to get weld quality and cycle time, we are contracted direct. We have done this 3 times now. However its difficult to get other companies on board with this principle, so let them keep paying over thetop, we end doing it in the end anyway ! Peter Struwing A.Sc.T • Installing automation to do a certain process is easy and there are many integrators that can do just that. But to fully understand the process in-depth is another story! That takes time to learn as stated by Fraser. I always find it quicker and easier to train a person that knows the process in depth how to run the automation as they know how the processes need to work. Training an automation person to weld or paint takes a long time as they have to be trained on the process which can take months or years. Fraser Reid • Now remember, don’t go telling industry to much, we have to charge them loads of money to dig them out of the hole they put themselves in all the time. Maybe we should encourage them to keep trying to execute the systems with industrial engineers . Lets start a campain across the globe for industrial engineers to take on all automation applications. We could really cream it in, in fact come to think of it, that’s what have been doing for 10yrs, so hey, don’t rock the boat, somebody needs to pay for my kids education ! Brian Dobben • Fraser, I love that! Hilarious. But from the mfg side, I’d much rather pay you guys good money to do it awesome upfront (including in the product/process design stage and offline programming/simulation), rather than to “dig them out of the hole”, because in the end it would end up producing better results with a lot more profit for everyone… except the IE’s? Fraser Reid • Hi Brian, even better ! get the offline guys to program the lines, then we can make even more money putting there “interpretation” of how to weld correct, love it when they actually have to put weld down on poor fitting, oily production parts with tooling in the way. All those years of having to deal with an industrial engineers tooling and an industrial engineers part manufacture comes into being, and the offline boys have no experience of those issues. = more money for me. Or like Nissan you just pay us to do the job from the start, but you have to pay well, not rates of “pendant jockies”. I am quite a snob when a prospective client tells me some line pendant jockey is “only asking X dollars an hour”. I say well use them them and pay twice as much for 1/2 the quality, I have to go off in my RV hill walking, give us a call when you want the job done right. I have 30yrs experience, an apprenticeship at GEC and diploma from Loughborough university in Production engineering and Robotics. As you can tell, it really gets me miffed when some “industrial engineer” talks to me like I am some sort of fool. I wonder why I tend to upset those people so much ? Ha Ha Ha. Peter Struwing A.Sc.T • Don’t get me wrong, invoicing is fun and we all need to do a lot of it to make up for the last few years. But that said, invoicing over and over for process issues that the clients should be able to resolve themselves turns bad quick! Makes the good guys look bad! I do most of my robotic work in industrial paint, and some welding. Both painting and welding I have done by hand since I was 16 but not enough to call myself an expert as I have no formal training, which I am not and I make that clear to the client. But I am educated and trained in robotics and have the documentation to back up a statement that I am an expert in industrial robotics. But I find going on site and showing the clients operator, engineers and managers the basics of the process so they understand why the automation is not working. I have to train them to use the automation to help improve the process, which means tons of documentation. In welding you have several variables that need to be documented, in paint there is dozens. So when something goes wrong, the documentation can be checked to see what has changed before they call me, then when I invoice I feel better in net 30! Fraser Reid • Done paint, took about a week, 1986 Landrover 16 colour changes etc.You know what they say in life, if you can piss you can paint ! Ha Ha Ha what do you expect from a welder ! I think you may find welding 2 car pressing together takes about 3 variables, welding a SS Duplex Neucler container with the plasma keyhole process in the HV a bit different. Sod the documentation, got to get it to get the hole to close in the HV, any suggestions ? By the way never seen a ship sink, bridge colapse, train crash, plane disintegrate, axle fail, boiler explode, turbine shatter, child seat fail from being painted wrong. Not in the same league process wise. or are you talking about RSW (Force, Time, Current profile, not counting variables introduced by interface pressure variations due to fit-up, or distance to edge, or changes in current density as tips mushroom and bring “steppers” into the picture)? Remind me what “HV” is referring to? Scott & Peter – thank you also for your comments. Fraser Reid • HV is Horizontal Vertical, bugger to weld with plasma keyhole technique. More variables, multi angle for multi pass, gap analasis and volume fill by laser vison coupled with on the fly speed, weave freq/amplitude/edge delay wire speed and voltage control. Then we can close the loop using profibus interfaces to compare actual welds to previous data on a look up table to find trends for poor starts tip wear and general poor fitup. Oh what a lovely easy process we indulge in ! Started to write a book years ago, its about all my experiences in the industry, wanted to make is a bit like “Rivet Head” but with a lot more technical stuff. Couldn’t write another “manual” so boring. Maybe I will write the memoirs of a robotic welding engineer one day. Yea gods we had some fun back in the 80’s loads of money about and robotics was a fairly new business, all young people working and playing hard. Halcyon days. Anyway, back to feeding the kids !!!!!!!!!!!!!!! Peter Struwing A.Sc.T • On an automotive door hinge welding cell installation I worked on a few years ago. I trained the welder that had been welding the part manually for many years to operate the robot, when I asked him the settings he used for voltage and wire feed he said “turn’em up full then back it off a bit till you stop blowing holes”. I gave him a copy of Lincolns welding basics hand book! Showed him the reference tables and we had a good approved part after 4 trials! The plant engineer came out and asked for a copy of the book too, he had never seen such a book before! They had 35 welding stations. Oh… and the company went belly up! Cannot imagine why? We are planning to make a new technical career, it would be an especiallization on robotic welding, but the trainees must be certified welders first, to apply for this . In your opinion, do you think that the AWS robotic welding certification is enough, or what would you reccomend to add. Sorry, didnt introduce my self: yours truly is a consultant for a non profitable goverment technological institute, oriented to vinculate state of the art technology to the general industry, specially the ones who can not afford to pay for it, but have the willness to become more competitive. We put all of our equipment and human resources for the benefit of who ever needs it. and we only charge a symbolic cost as a recovery fee. We are in Monterrey Mexico, were the lack of this speciall human resorce is driving the companies to deppend way too much on the availability and dissposicion of third companies, to resolves kinder garden problems,and sometimes the robots remains unuse for weeks. Hope i can come here and ask for your advise. Brian Dobben • Well, I’m several weeks into a new adventure now. I’ve found an integrator whose mission is to help save jobs and plants, by delivering diverse high-performance industrial automation. I get to help in the welding automation end of things. It’s going to be quite a fun ride I think. Just think of the strange novelty – a manufacturing welding engineer working for an automation integrator! If someone you know is looking for high-performance welding automation in the U.S. or Canada, we’re open for conversation! I can be reached directly at bdobben @ EllisonTechnologies dot com. Fraser Reid • About time the integrator recognised the need for some expertise in this area. However this is not good for my business Thanks god 99% of them are oblivious to this need, keeps the bread on the table ! plus here in the UK they havn’t trained anyone for years anyway so there is no one o hire anyway. How’s this then, we are going to build 10 new Nuclear plants and have to get the French and USA to quote supply and build as we have lost all the skills over the past 25yrs. Manufacturing down to 14% GDP. Trouble is we still have great capabilities, just need a banking structure to support it ! Jeff Noruk • Fraser you have excellent honest comments as always. Scott you are also right on with your comments. I would like to add one comment to the lack of robot programmers that know how to put the weld wire in the joint with the correct torch angle, welding parameters, etc. I have been on both sides of the fence as a robot user and as a robot/peripheral equipment supplier. I also have been active in the AWS D16 committee dedicated to Robotic Automation Standards and probably the most important one that we developed in this committee has to do with the qualification and certification of Robotic Arc Welding Technicians (CRAW-T). You can’t become one unless you can pass a written and hands-on test that challenges you to answer questions similar to the AWS Certified Inspector test as well as actually make a weld with the robot that meets a welding standard similar to AWS D1.1. Anyone that can pass this is at least “in the game” as far as being able to properly program a robot for high quality arc welding. Go to http://www.aws.org for more information-several USA companies are now certified to give this test in concert with AWS. Fraser Reid • Hi Jeff, We have just had initial meetings by robot integraters here in the UK and I raised the point that anybody can claim to be a robot welding programmer. Its complete madness ! manually I would have to pass a test, put a pendant in my hand and I am a welding God ! So I have proposed the same system as you chaps (honest mate, I have been yabbering on about this for years) trouble is time to sort it out when trying to make a living. Question, who did the work to set this up and can I “aquire” all the info so we can setup here in the UK ? I will put it to the next integrators meeting. I think the end users would love this, I refuse to send pendant jockies out on my jobs but many teir one integrators do, its a total waste of industries money. By the way Jeff, found all the info on the website thanks. Seems pretty comprehensive. Matt Hendey • Your hitting a lot of nails on the head guys. Stay the course and don’t loss the fire. The self-inflicted struggles faced by manufactures seam to only be won after desperation, and a little money. Only then do managers and/or owners get off there thrones and put some heart into the task knowing they have no other person to point the blame. This is were the true practitioners shine by saving the day until the said manager and/or owner can steal the glory at which time they will stop returning your calls. Ha Ha!